Meet Thomas. He’s a curious rectangle who has continued his journey from platform to platform, and I’m not just talking in-game here. Thomas Was Alone ($4.99) was first released for PC and Mac back in 2012, and with the help of Curve Studios’, both PS3 and PS Vita version were released in early 2013, with brand new exclusive content. 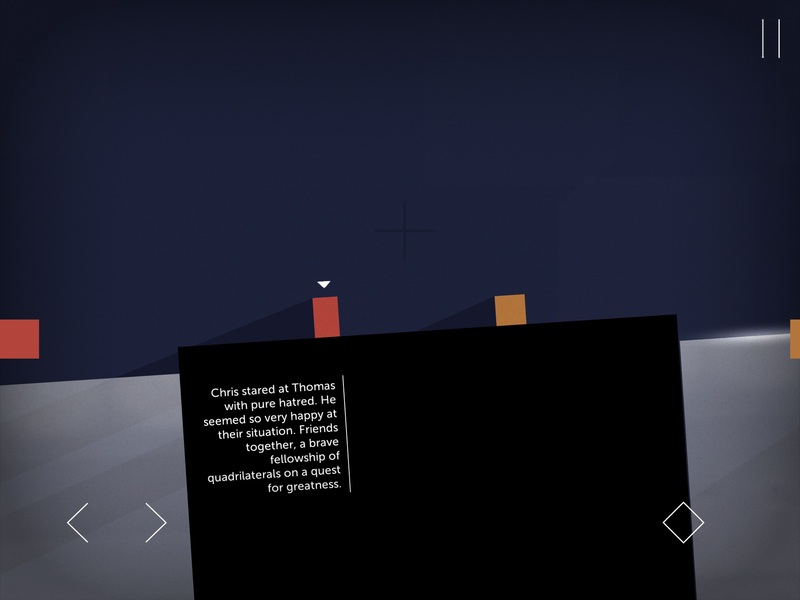 It was certainly successful, and created a lot of buzz, and now one year on creator Mike Bithell has teamed up with Bossa Studios to bring this BAFTA winning, bestseller to the App Store for iPad users to get a taste of just what all the fuss is about. The game looks absolutely beautiful on the Retina display, and it goes without saying that Thomas is a game that is perfect for the tablet platform. Everything from the original version is present and correct, from the pretty melodic soundtrack to the pleasantly simple graphic style, which perhaps look just a little bit crisper on the bigger HD Retina display. As you guide Thomas and his friends throughout each level, a story unfolds, narrated by the ever-fantastic Danny Wallace (yes, that Danny Wallace, of Assassins Creed fame), and you’ll be able to read along as you go thanks to the on-screen text snippets that accompany the voiceover. If you’ve not played Thomas Was Alone previously, then you’ve certainly been missing a treat. For the uninitiated, Thomas is a pleasant puzzle platformer that follows the story of a rectangle and his other “shapely” friends as they unravel the very mysteries of their existence in a strange and unfamiliar world. The controls handle brilliantly on the iPad. One of my fears was that porting the game would lead to problems getting used to a whole new control system, especially as touch-controls can be somewhat hit-and-miss, but my fears were allayed as I discovered that this is the perfect game for the touchscreen interface. You simply move back and forward using the on-screen arrows, and tap on the diamond to jump. As the game progresses, you’ll learn you can switch between “characters” by simply tapping on their corresponding colour tabs at the side of the screen. Now everyone knows I’m not the greatest where it comes to puzzle games, but Thomas Was Alone is simply so accessible that my own mother could probably play it. Hell, my cat could probably play it. Sure, it’s challenging from time to time, but not in the sort of rage-inducing way that makes you want to throw your console out of the window. The hardships I endured throughout each level taught me that every obstacle can be overcome, and as the narrative unfolded I felt that these characters could just as well be real people, with actual personalities. Each one of them has their own story to tell, it’s simply beautiful, and I realised that playing through the game for a second or third time didn’t lessen the impact of just how brilliantly and well executed the concept of this wonderful game is. As you meet the overly jealous Chris, the extremely proud John, or the remarkably unique Laura, you’ll realise that these characters are not just the shapes they portray on-screen. They’re as human as you and I. Let that sink in for a bit. At $8.99, the game may be a little more expensive than the average iOS game, but don’t let that deter you from the sheer quality of this beautiful indie platform puzzler. It’s worth every penny you put in, and you’ll get a good three or four hours of enjoyment, along with a heartwarming tale of friendship. Would could say no to that? If there’s one thing we can be certain of, Thomas definitely isn’t alone anymore.